Children love playing with playdough, but how often have you reached into the back of your cupboard only to find that it has all dried out? Now there’s no need to worry about not having fresh playdough to hand on a summer’s afternoon, or not having enough if your children have friends round. You can easily make your own playdough, adding food colouring to make it as bright as you wish. 1) First, encourage your children to measure and mix all ingredients together – except for oil, food colouring and water - teaching them first the importance of scrupulous hand-washing and necessity of keeping a clean preparation environment. 2) Next, place the ingredients in a saucepan, then add water, stirring constantly to get the consistency as smooth as possible. Add oil, then food colouring, then place on medium heat, and stir continuously until everything is completely dissolved. 3) Finally, wait until the dough cools completely – about 30 minutes - then have children roll it out with a rolling pin. For a rainbow of colours, you’ll have to make additional batches, so you may want to decide on which colours you want to make first. Warning: Playdough can smell tantalising to an animal, but the amount of salt in this homemade concoction can be lethal to a dog, in particular. Keep playdough away from all animals. Make a playdough necklace. Roll dough into balls of different sizes, or make coils that you then cut. Poke a hole with a pencil and leave to dry. Paint, string through with string or wool, and you’ve got a brilliant necklace. You can string pieces of painted pasta (with holes, such as macaroni) in between to add contrast. Have a playdough contest. Have the kids pick a topic and create playdough sculptures on a certain theme. Judge them according to skill, originality, size etc. – just make sure everyone gets a prize! Make a 3D project. 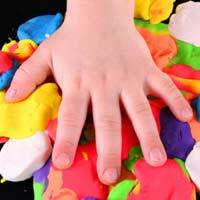 Round up some small buttons, coins, pieces of felt, pipe cleaners and other objects and make playdough “pictures”, pressing them into the dough. Let dry and paint. Making playdough is a fun and enjoyable activity that is fantastic when a summer afternoon turns rainy or cold, or simply when the kids want to get all crafty and need a project that will make the most of their imaginations. If you keep the playdough in an airtight container – even a Ziploc plastic bag will do – it will last for months, as long as it is sealed properly. And when you finally do need more, you’ll have the fun involved in making it all over again!